To say we’re excited this mare is a major understatement! Gazania not only became ster with the very high score of 85/80 in 2014 at her first keuring in Holland–at her second keuring, she went on to be named keur eligible and high scoring mare, plus was selected for the National Mare Show in Ermelo. 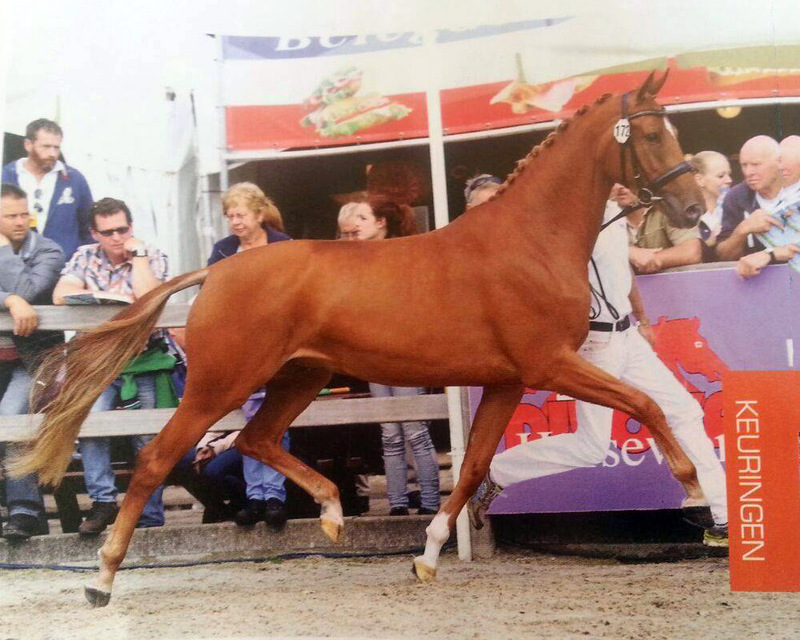 At the National Show, she qualified for the final ring of the top 11 mares, eventually placing sixth of all Dutch mares in 2014. Gazania then went into training for her IBOP and, on November 18th, she fulfilled her requirements for her keur status, scored an 83.5 in her IBOP, was top dressage IBOP of the day, and one of the top 10 dressage IBOPs in Holland that year. Unbelievable! A little history: Gazania hails from our mare line. Her great granddam is the one and only Charites, the dam of Orchis. In the winter of 2008 or thereabouts, I visited my favorite breeder in Holland, the ever-charming Gerard Vervoorn. He showed me this incredible coming-two-year-old filly, Bertolonia. I had to have her and we agreed on a price. Well, as the months went on and my friend didn’t send me the wire transfer information to send him the money, I became a little confused. Long story short, he just didn’t want to sell the mare. And I can’t blame him. She went on to score a 90/85 or something outrageous at her keuring. But I did convince Gerard to sell me the mare’s first foal: Gazania. (Carol and I also fell in love with her second foal, but that’s another story!) The moral of the story… everyone’s happy. Gazania produced a super colt by Eye Catcher, Knockout SSF. Champ found an incredible home with the very talented Emily Donaldson. Gazania lost her next two pregnancies, but this year, she carried a UB-40 filly, Namesia SSF, and she had an ET colt from Vitalis, Namath SSF. I’m pretty sure we’ll breed her to Gaudi this year.